How Much Does it Cost To Fly To Flagstaff? The cheapest flights to Flagstaff found within the past 7 days were $174. Prices and availability subject to change. Additional terms may apply. There is not much business for flights to Flagstaff – many choose to fly into Phoenix’s Sky Harbor Airport (PHX) – but the city has an airport where you can fly to Flagstaff from Phoenix via US Airways’ Skywest Airlines. This small airport offers several flights to and from Arizona’s capital. Flagstaff Pulliam Airport (FLG) only has one runway and serves an average of 125,000 passengers each year. FLG is city-owned and is used most for general aviation services, such as military flights. Though flights are few and far between, it is recommended you arrive an hour before your departure. You can use the time before boarding through one of the two gates to grab a bite to eat at the café, which offers happy hour each day. FLG gives passengers free Wi-Fi access, free parking, and also displays some Sedona art pieces to enjoy. The airport is set outside of Flagstaff and has a great view of the surrounding trees. 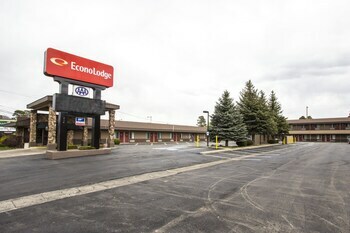 If you have just arrived, there are several major rental car companies stationed there as well as the Flagstaff Visitor Center to help you plan your stay. Question : Where can I find cheap flights to Flagstaff? Answer : We know you’re looking for the best flights at the lowest fares, so we found some of the sweetest deals in town just for you. 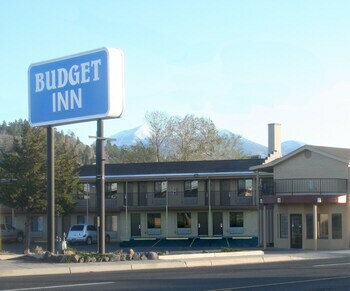 Check out the top flight deals to Flagstaff. Act quickly and score yourself a bargain! American Airlines has a flight from to Flagstaff departing on 4/30/19 and returning on 5/4/19 all for only $184.00 per person. * Book these American Airlines flights! American Airlines has a flight from to Flagstaff departing on 5/21/19 and returning on 5/25/19 all for only $238.00 per person. * Book these American Airlines flights! American Airlines has a flight from to Flagstaff departing on 5/17/19 and returning on 5/21/19 all for only $343.00 per person. * Book these American Airlines flights! Question : What are the most popular airlines that fly to Flagstaff? American Airlines Flies 81 flight per week between and Flagstaff. United Airlines Flies 51 flight per week between and Flagstaff. Delta Air Lines Flies 17 flights per week between and Flagstaff. 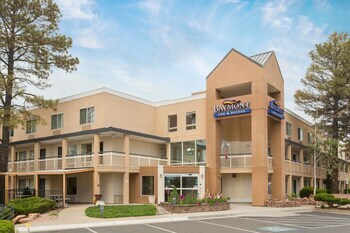 Question : Which hotels are located near airports or major attractions in Flagstaff? Answer : We've put together a list of hotels in Flagstaff close to airports and popular sights to see. Check out the hotels below. 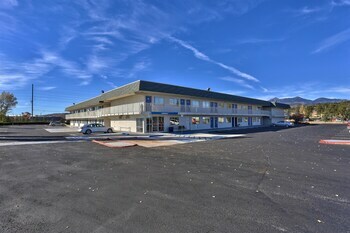 All of them are within proximity to must-see attractions and major airports in and around the city of Flagstaff. 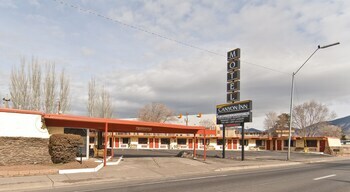 Highland Country Inn: This central Flagstaff hotel is across the street from Northern Arizona University and a half-mile from Lowell Observatory. Arizona Snowbowl Skiing, Grand Canyon, Meteor Crater, Petrified Forest and Sedona Arizona are also nearby. This hotel has a 2.00 star rating. 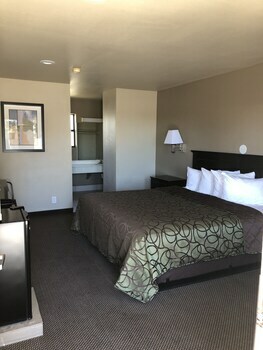 Twin Arrows Navajo Casino Resort: Located in a rural location, this family-friendly resort is within 25 mi (40 km) of Walnut Canyon National Monument, Meteor Crater, and Lowell Observatory. Flagstaff Mall and The Marketplace and Bushmaster Park are also within 25 mi (40 km). This hotel has a 4.00 star rating. 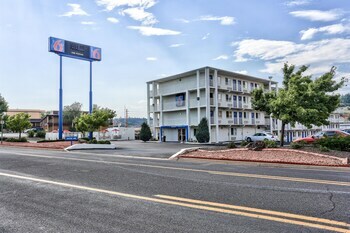 Little America Flagstaff: Just off I-40, this hotel is on 500 acres of Ponderosa Pine forest, and yet is only two miles from downtown Flagstaff. This hotel has a 3.50 star rating. 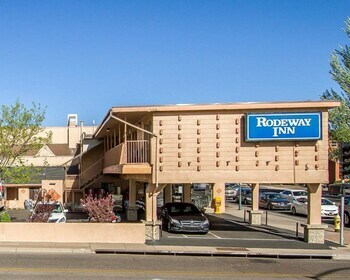 Rodeway Inn And Suites Flagstaff: Located in East Flagstaff, this motel is 1.6 mi (2.6 km) from West of the Moon Gallery and 3 mi (4.8 km) from Lowell Observatory. Flagstaff Symphony Orchestra and Flagstaff City Hall are also within 3 mi (5 km). This hotel has a 2.00 star rating. Question : What are the top attractions in Flagstaff? Answer : Flagstaff has over 27 points of interest for you to choose from. We suggest checking out Grand Canyon National Park and Oak Creek Canyon first because they are the most popular attractions in Flagstaff. Don't forget about other highly recommended spots like Coconino County Fairgrounds, Coconino National Forest, and Lowell Observatory. Get out there and see what the city has to offer on your trip to Flagstaff! We only stayed one night, but had no trouble checking in and the room was clean and spacious. The mattress was a little uncomfortable, and the shower head was low. The continental breakfast was decent.